As we part ways with 2018, it’s easy to get caught up in the frenzy of making New Year’s Resolutions. We quickly start jotting down all the things we want to change about ourselves and vow to make the upcoming year the best one yet, even when the one that’s just ended was pretty good, too. It’s one of those traditions that always start with the best of intentions, but can be hard to fulfill because of life’s everyday responsibilities, whether it’s work, school, family, etc. Although sometimes, it’s just the sheer lack of motivation (if we’re keeping it real). This year, we invite you to make a simple resolution you can keep. We’re challenging you to get out of your comfort zone when it comes to your personal style. Just making a small adjustment to your wardrobe can make a big difference and, you’ll probably realize getting out of your comfort zone isn’t so difficult. Here are five little changes you can start making today. 1. Play with a pop of color: Ladies, if your closet is filled with black plus size dresses, cardigans, tops, pants, and more, it’s time to let a little color into your life. While black is a timeless shade that makes you look polished and ready for any occasion, don’t let your closet look like it’s ready for a funeral. It’s fun to brighten up your wardrobe with different hues and you’d be surprised with how different your outfit can look when you just add a little pizazz of color. The next time you’re shopping, pick up that red cocktail dress with sleeves or that green faux wrap top and leave the black styles behind. 2. Dare to wear a different silhouette: Do you find yourself reaching for wrap dresses for every occasion? This year, we want you to try a silhouette you’ve always had your eye on but have never purchased because you’re afraid it’s not YOU. The great thing about fashion is you can experiment with different cuts, fabrics and styles. If you’re always living in an A-line dress, try a bodycon style. If you’re always sporting maxi dresses, show off a little skin with a knee-length skirt. Remember, your confidence is what really shines when you’re out on the town. 3. Get into print: Shopping for solid colors always seems like a sensible idea when you’re looking for styles to wear to the office. However, if the thought of wearing prints puts you off, then we want you to reconsider. Prints not only add color to your wardrobe, but also add a nice detail to your outfit that will make you stand out among your colleagues. Invite playful stripes into your closet and don’t forget to pick up some lovely florals, too. 4. Keep it casual: Wearing a dress can make you look picture-perfect for any occasion, but sometimes, a casual outfit can also make a strong fashion statement. 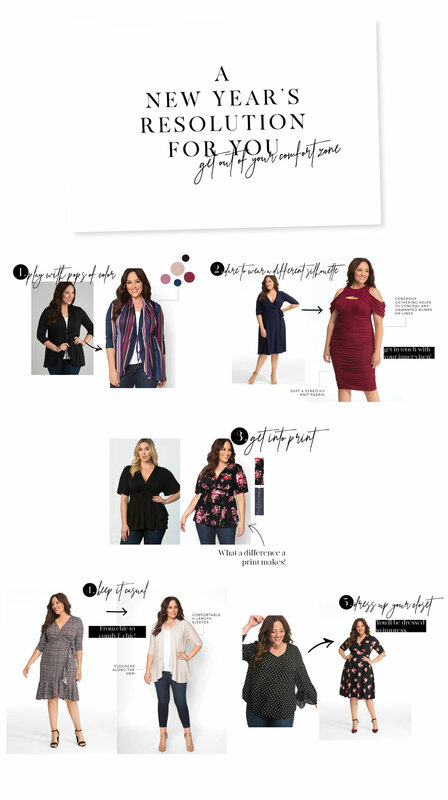 We tend to associate casual wear with being frumpy, but there are plenty of plus size tops and cardigans that can make you look polished and chic, as well. Look for separates with special details like flounces, ruching or ties and enjoy the comfort of keeping it a little more casual when you go out. 5. Dress up your closet: If your wardrobe consists of mainly tops and jeans or leggings, then dress it up a little for 2019! Try different dress styles to find the dresses that make you look and feel your best. If you’re unsure where to start, you can never go wrong with a flattering A-line dress with pockets. You’ll still be dressed up, but you’ll feel comfortable, too. Whatever you decide to work on for 2019, we wish you much success and fun while achieving your goals! Happy New Year, Everyone!